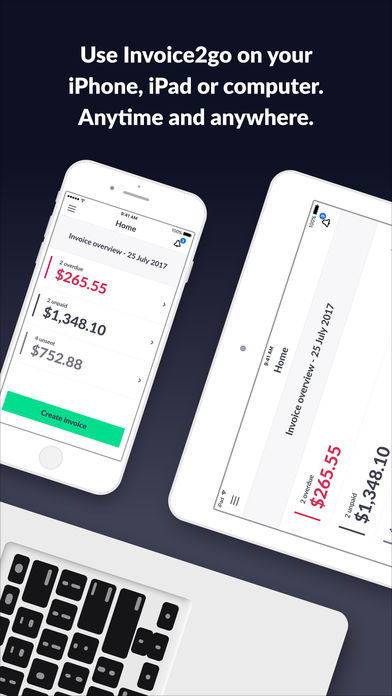 Send simple invoices using professional templates, invoice generator, PDF invoices and quotes, online payments, bill organizer, receipt and expense tracking, time tracking, time management and business reporting all rolled up into one easy-to-use app. 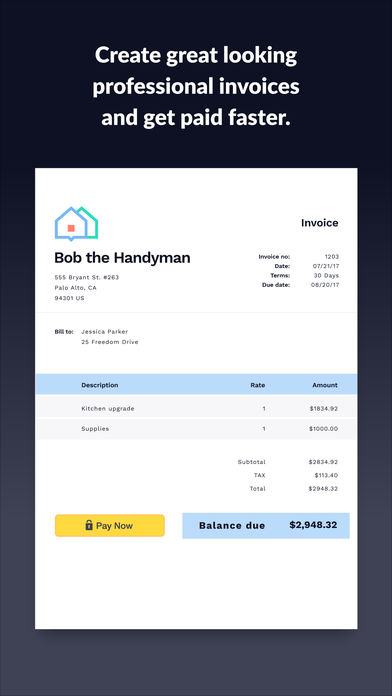 Create a construction invoice or estimate, business receipt for your side gig or track receipts for your small business, all with Invoice2go. Start your 14-day trial today and get 50% off your first year! Owner / President of Hill & Sons Ltd. Comments: I have been using Invoice2go for about two years now. Invoices have disappeared from their database on a regular basis over the two years. Fortunately, because I BCC all my invoices, I had backup copies in my email. My invoices that I emailed out did not reach my clients. Invoice2go figured they'd been delivered to their junk mail. Some of our commercial clients keep us waiting up to ninety days before paying, and so we waited. When we finally determined that they hadn't ever received the invoices, it was sometimes six months or more before we got paid. Invoice2go recommended that before sending an invoice, that I contact my customers and get them to change their email setup to accept our emails. When Google Chrome updated, Invoice2go didn't; they were incompatible and it would not work properly. I switched to Firefox but continued to have issues. All of my settings, the email message ...all were dropped when I switched over. As a result, and unbeknownst to me, I was no longer BCC'ing my invoices to our company email. During that interval the database dropped another fourteen invoices and I did not have my email backup to rely on. It took a week in the office with my employees, going through the database, time sheets, and work orders to restore those invoices. The problem was further exacerbated by the fact that I didn't know who the invoices were for, if the jobs had been completed or if the invoices had even been mailed out. I lost all the material lists and the pricing. I also discovered that a lot of customers don't call to complain that we didn't send them an invoice. I cannot use the scroll wheel on my mouse. I even went out a replaced the mouse. I can scroll only with the arrows on the keyboard. When I create a new invoice, I would say that once every five or six invoices it screws up the sequence. If you miss it, it looks like a missing invoice. In my case I had emailed backups to prove that there had indeed been an invoice, but it can confuse the issue. The spell checker will point out spelling mistakes, provide the proper spelling but when corrected the word immediately reverts to the incorrect spelling. Pros: Simplicity of use and works for my business without the overhead of a full accounting package. Syncing that works flawlessly now, they have clearly learnt from the past. Cons: With the older version, syncing was often a problem and when they revamped the software they simplified a little too much, taking away some much loved features and a delay in getting data back to people. They seem to be improving with their customer service though. Overall: I don't have to change how I work and learn a larger accounting/invoicing package. I also can accept credit card and other payments without hassle. Pros: I've used this for at least 6 years. I like a number of things about invoice2go. I can easily convert an estimate to an invoice with one click of a button. I can add items to an inventory list and call them up easily for estimates. Cons: Originally the software cost a fraction of its current price. I've chosen to continue using it as they have good customer service and I don't want to switch software as this is easy to use. Overall: I have to say that their customer service has kept me as a customer. A few years ago I had an issue and customer service assisted me. Works well enough, but it is quite expensive for what it does and it has a lot of little quirks. 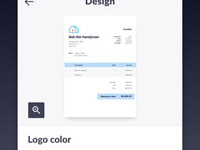 Pros: Invoice2Go has a lot of beautiful invoice templates, and a good amount of ways to customize those templates to your liking to great something to be proud of. Adding custom fields is pretty easy too, and accepting payments by way of Stripe and PayPal is a plus. Cons: They only offer a few payment gateways out of the thousands available, and other than those few gateways, no other integrations are available. I would love to see integration with a cloud storage service to export data and PDF invoices too, and even better would be integration with CRM apps to instantly port those items to as well. As it stands I have to use multiple systems for one task. There are also a lot of quirks when it comes to where things land on invoices - for example no matter how short your invoice is, any customer terms or notes always appear on the following page, even if there is ample room on the first. Just lots of things like that. It's also very pricey for NOT connecting into a CMS or CRM. 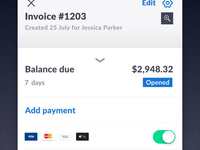 Overall: Fast and easy invoicing, integrated payments by PayPal and Stripe. Pretty Good, could be improved a bit. Pros: It is very easy to use, allows customers to pay directly from the email link. Hassle free. It does an amazing job of keeping my payment records in order. I like the separated sections for paid & unpaid invoices as well as the various search options. Cons: I wish I were able to create my own template for how I want my invoices to look. They have pretty good options but the flexibility to move things around and freely edit would be nice. I also can't seem to delete/replace my original logo. It's been updated but I can't figure out how to do it. Overall: Overall, it gets the job done and that's what really matters. No real complaints from me. Cons: loses invoices, cannot make progress bills off a single invoice, such as draws on a project. Overall: Loses invoices, they vanish, and cannot be retrieved. I have noticed that I have lost invoices and they are completely gone, I called customer report if I can find the invoice number they can retrieve it?? Does me no good if it comes up missing and I don't see it gone. I don't understand why they can't find the Glitch in the software and guarantee me that it won't happen again. I am currently looking to find a better invoice software. Pros: I love that it's a one stop app. You can do everything you need to for the book keeping side of your business with this one application. I love that you can turn estimates into invoices so you save a ton of time. You can also see when your client views the invoice and set up automatic payment reminders. This takes the pressure off of you to keep after delinquent accounts. You can even store and track your business receipts. Plus I can use it on all my devices. It really does everything and more ecspesially for a free app. Cons: It does require a lot of different permissions on your device but anything that tracks you does. I just make sure my virus protection is up to date. Overall: One step book keeping for my husband's business. Pros: It was easy to navigate and use. I loved the templates. .It was reliable and I was able to create many subfolders for one year. Cons: Since going onto internet and icloud and getting away from the computer desktop, it has become a nightmare. I lose invoices and have to recreate them which takes a lot of extra time!!!! Overall: For 9 years it was excellent, not now!! Pros: We tried to switch from quickbooks to Invoice2Go and we were highly impressed! It's truly a simple, intuitive app. It allows for us to collect payments, send invoices and track expenses. It's quick to set up an invoice and send. We loved it! Cons: We simply outgrew the software. Our business developed into a multi faceted business and we needed something more robust. Highly recommend Invoice2Go if you are a small business. It will help elevate you to the next level. Overall: Highly recommend for new business owners.
' I am on speed dial to technical support. They know me by name. They are really nice people, but whenever they say they will get the engineers to look at the problem, that's the kiss of death. They have yet to resolve even one issue for me. They have never found a missing invoice ...not even one.
' This program has been a MAJOR source of STRESS for me and has cost me a ton of money; not to mention credibility with my customers.
' I have also discovered that old invoices are very difficult to collect from customers. 'For those of you who give it a good rating 'check back in your invoice database. Follow the sequence and see if they are all there. Odds are, you are missing invoices as well 'you may just not realize it.
' Why did I stick it out for so long? ...my database is extensive, I was established and I never stopped coping and hoping that they would fix this glitchy program.
' This morning I discovered two that more invoices (that I made up yesterday and emailed out), are missing; that was the last straw.
' I am switching to QuickBooks and I hope never to look back. I don't care how much it costs; if it works - it's a bargain! Pros: Nice templates, relatively pain-free invoice creation and submission, decent reports that help my accountant file my taxes. Cons: It does not take rates out to 3 decimal places. Mileage rates are always out to 3 decimal places. Therefore, every invoice I submit is incorrect and payments are impossible to reconcile. I used to be able to enter mileage rates to 3 decimal places but with recent updates that option is no longer available. I've begged them to change this but so far they have not. Their responses list all the wonderful features of their app, which is not responsive. Also, there are occasional sync issues so invoices created on one device do not show on another. This causes endless wasted hours recreating invoices. The desktop app is unreliable. I'm a long-time user but I'm now searching for a better invoicing program. I work with this software daily for almost 7 months now. Pros: I like how user friendly it is. I started working with this software and got very little training. I figured it out pretty quickly. Cons: I do not like how you can't search for names on the invoices easily. This also applies to the app version of this software too. It is a headache if i have to look up a previously sent invoice. I also do not like the image limit when uploading a picture to attach to the invoice. Comments: This app has performed on the highest level for me and my small business! I highly recommend this product! Cons: It doesnt function very well. Feature less and customer support doesnt listen to feedback given. So many issues , product doesnt sync. You loose information very easily. And if support listened to feedback they would do so much better. Its awful now and am seeking a new product after being with them for over 10 years. Overall: None anymore it been ruined with poor redevelopment and customer service who do fix issues or errors. Most certainly not worth the subscription. I bought the license years ago and now I'm expected to repay yearly so its a con. Nothing now it has been ruined, it has problems with capital letters on addresses. All live invoices are mixed in with invoices that are dead completed. So u cant separate invoices that are completed. Pros: What appealed to me most about Invoice2go, was the different layouts and options they offer so I could customize the look of my invoices. It allowed me to personalise them for my customers. Cons: At this point I can't think of anything worthy to complain about, overall this has been a very useful tool for me. 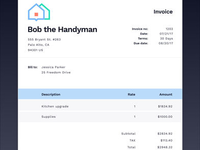 Overall: Invoice2go is effecient, practical, and can even be fun. I recommend this program for anyone who works for themselves and needs a quick and easy way to instantly provide professional, quality invoices for services rendered or when a receipt is necessary. It stores everything for you safely, and allows you to modify also. It's safe and secure so I have no issues of potentially having to deal with outside tampering of my created or new invoices. I can send them to my customers with ease and do it instantly. Pros: You can look back at jobs from a year or two ago and know exactly when they paid and when you did the job. 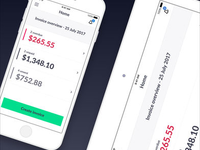 helps you keep track of what people owe you. Invoice someone from your car quickly and help you get paid quicker. 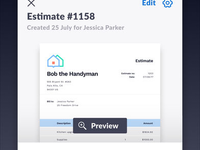 easy to track and send invoices. easy to bill clients in a professional way. Cons: they could work on the creating invoices and it does tend to get a bit confusing at times. Overall: i do this software so easy to use and bill my clients and track my payments. Cons: The only thing I can say I really did not like was the fact, that you are unable to change font, underline or bold. As well as size of font. Pros: I love how easy it is to use. It sends invoices quickly and effortlessly. it's super user friendly. Cons: I have had a couple invoices vanish mysteriously. Overall: Overall, I had a great experience with Invoice2go, I would definitely use it again. 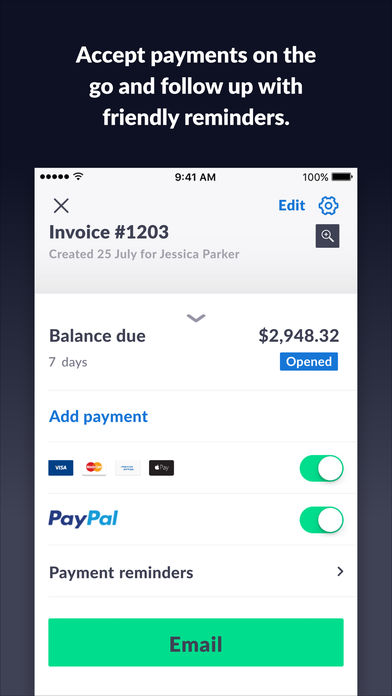 Pros: Ease of use and being able to create and send invoices directly from my phone. Cons: Limited ability to customize fields and search function could be improved. Cons: THEY DO NOT ALLOW FOR TRACKING INVENTORY, AND THAT IS A BIG THING FOR ME. Pros: The software is easy to use for people who are not a computer savvy. It is not difficult to go around the application without actually asking for customer support. Cons: Now here comes the hate part of this software. Invoices tend to go missing. Maybe it is just in my case but hey, can someone actually fix this software? Cons: Everything, can't navigate smoothly, takes 2 to 3 moves to do what use to take one. Loses info and sometimes won't save files. I will be changing to a new app as soon as I can. It used to be good but after recent update, they lost over a dozen appointments costing me thousands and they didn't seem to care. Then after trying to move around or work in the new "updated" version is bad really bad unless you're a computer nerd. Overall: A joke.....a sick joke. It will destroy you i promise, it prints blank statements, re arranges your invoices, duplicates entries , slows to a standstill when downloading, loses complete entries all the while you can not trust this mess, and as for the Zendesk?????? please give me strength. Pros: The software is easy to use and UX interface is ok.
Cons: You can't really go wrong with this app. Pros: This is somehow good about making quotations, nothing else. Cons: Decided to give it a try as found it useful for quoting, I was never aware they can, and they took payments from my customers, on my behalf, without my agreement and without holding any bank or financial details about me or my business. Settings are completely wrong if you are non-US and it's a very complicated, time consuming and laborious process to put them right. Your quotes and invoices will have links to third parties, as well as promoting themselves instead of your business. Will send unnecessary and detrimental reminders to your customers. The template for when sending a quotation or invoice cannot be modified and saved, you'll have to edit the text every single time. Once my prescription runs out, which unfortunately is 1 year, will leave and never come back. Overall: Extremely disapointing, tried to contact them several times always having an automated reply from a robot, there is NO customer service. Cons: They take payments with no account details to put the money into from your customer. Never return calls , been awaiting refund for a month my customer still hasn't had the money back. They blame stripe and stripe blames them. They are acting in a very fraudulent way. Cons: Customer service is no good , and once you quit your service you can no longer access your old documents. it would be nice to be able to at least go back and re print a receipt for someone if they need. Especially if you used invoice to go for 5 years. Overall: Most of the features are available elsewhere for less. If you want to buy the service , purchase monthly. I purchased yearly and when I was fed up with the service I had 5 months left for my yearly renewal and was told I was not getting money back when I wanted to get a refund only 7 months in. Pros: Maybe if you work with it for a longer time you get used to it but it's very confusing for a new user. The price is also quite high, much higher then other similar apps. Overall: I2GO is not a bad app, but it is way sooo slooowww, the design as in the 90's and UX confusing for a new user. I had first troubles to locate some features, also found some answers on the website after browsing through the entire FAQ site and also contacted the support - with no response. So I switched to another tool. 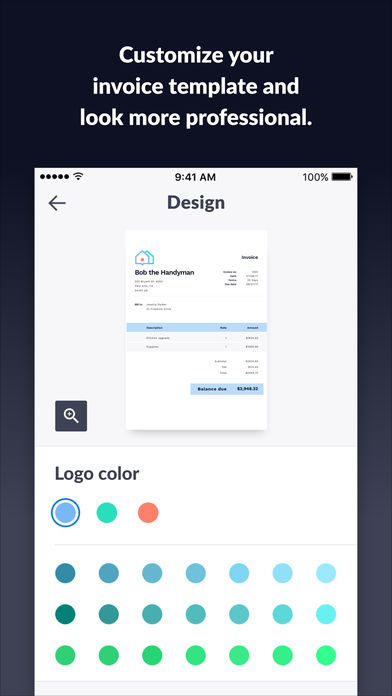 Pros: We really liked invoice to go and wanted to use it the interface is fast simple. And visually appealing. It's easy to use in the field, too quickly email invoices to clients. Cons: However, it's a little bit troublesome because it doesn't seem to integrate with other systems like quickbooks etc. So I tend to be more tailored for an owner-operator business and doesn't scale as well as other solution. Overall: I've used invoice2go for the last few years and can't believe the difference it makes in invoicing. The app is so easy to use on my phone, iPad or computer. Pros: I like having the ability to create my personal invoices and send them out all from one location. Cons: I would like more reminders on sending invoices and what balances I still have. 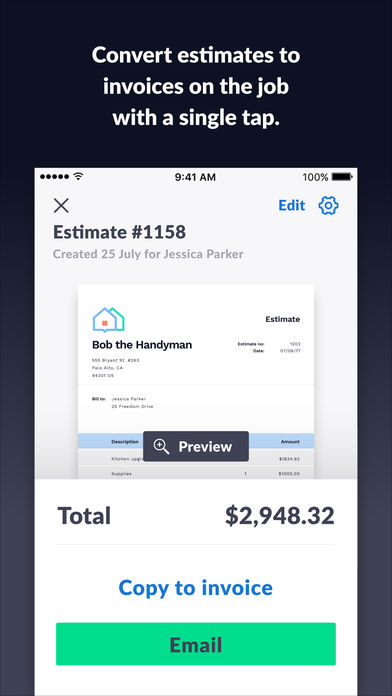 Pros: It's a perfect tool to use for invoices. No more going to the computer when I always have my phone. Cons: Nothing. It worked just as I had hoped. Pros: Easy to use via and app on your phone, take photos of receipts and send them with invoices. Pros: So easy to use...anyone should be able to figure this out. How nice is it to be able to go and make an invoice without having to use excel? Love it. Cons: Absolutely nothing. I think they blew it out of the park with this one. Overall: Great for any size business.